After debuting their mind blowing new live show at Coachella (off the back of a headline show at Madison Square Garden in December last year which sold out in nine minutes), Swedish House Mafia returns to the UK for their much anticipated headline performance at the Milton Keynes National Bowl, England on July 14. Just six weeks away, SHM are asking everyone to “Fly the Flag” this Jubilee Weekend to celebrate the start of summer and the 40,000 tickets already sold for what is going to be one of the dancefloors of the summer. 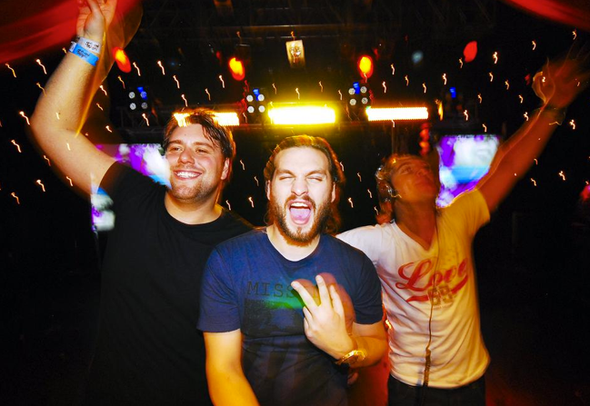 Swedish House Mafia have enjoyed incredible success in the UK over the last few years – signed by British institution EMI back in 2010 followed shortly by two sell-out headline Brixton Academy shows, then a UK Tour last year which sold out in a matter of minutes including playing to 20,000 people over two nights at Alexandra Palace. The Swedes are inviting everyone to attend the world’s biggest private party and want everyone to get involved and join in the fun. They are asking fans to “fly the flag” by changing their Facebook cover image to the bespoke new British-inspired design for the show… those that do will be entered into a competition to win the prize of a VIP Trip to the Milton Keynes Bowl show (including travel and accommodation) AND a trip to Ibiza for Swedish House Mafia Wednesdays at Ushuaia Beach Hotel. To enter the competition visit HERE. Tickets for the event are priced at £45 plus booking fee. There is also the opportunity to purchase the full VIP Swedes experience for £199 (inc. VAT & booking fee) where fans will have access to an exclusive VIP compound with private catering and bar, drink tokens for food and drink and access to the after-show party where DJs will play until 2am. Fans who have already brought a ticket are able to upgrade for £155 (inc VAT).